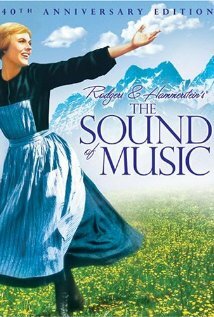 The movie and musical The Sound of Music is loosely based upon the story of a real life family that lived in Austria before touring in concert around America and Europe. Agathe Whitehead von Trapp, Captain Georg von Trapp’s first wife, died of scarlet fever in 1922. The family moved from Pola, to outside of Salzburg. Maria Augusta Kutschera was a young teacher at the Nonnberg Abbey (Nonnberg Nunnery) near Salzburg, Austria. She was, though not as readily in the film, a playful person and did slide down banisters. It was unusual to be called to the Reverend Mother’s office, so when Maria was called one day she went over everything she had done. In the room with the Reverend Mother, all her fears vanished. The Reverend Mother told of a family who needed a teacher for a young daughter whose health was fragile. Maria had no choice but to go, as the Reverend Mother confirmed to her that it was God’s will for her to go. The children wanted Maria to marry their father, the Captain, so they might have her with them forever. Maria frightened, returned to the abbey and asked the Reverend Mother if this was the will of God. She reluctantly returned and married Georg von Trapp. To see the ages of the children when Maria married the Captain, scroll down to the comparison table. The family lived happily in Austria together for almost 12 years before they left Austria. They did not establish their name of The Trapp Family Choir or sing in public until 1936. By this time the seven children of the family were 25, 23, 22, 21, 19, 17 and 15. Rosemarie was born in 1929 and Eleonore “Lorli” in 1931. In 1936, they were 7 and 5 years old. In 1938, the family went on concert tours through Europe and then a three month tour in America. They returned to a year Europe later, because their visitor visa in America had expired and they had been denied a renewal. They toured, and paid a short visit to Austria while in Europe. About a year later, they returned to America in 1939. The family now had 10 children. Johannes was born in 1939 in America. After touring for a while and living in Pennsylvania, they bought a large farm near Stowe, Vermont. Eventually, in 1944, they began a camp of “Sing Weeks” during the summer. The camp was a remodeled C.C.C. camp. Four times a summer, for ten days each, at least a hundred guests would come to the camp and dedicate the next ten days to enjoying the outdoors, singing, and gathering in the chapel. Captain Georg Von Trapp died of a lung tumor in 1947. He had been a heavy smoker until he quit when he married Maria at the age of 47. The family became United States citizens in 1948 after waiting five years. Martina von Trapp (Gretel in the movie is based on this real life person), died during childbirth in 1951, at the age of 30. Hedwig von Trapp died in 1975 at the age of 58. A fire in 1980 destroyed much of the original camp, and reconstruction began soon after. The Trapp Family Lodge was completed in 1983, and still operates with many activities throughout the year. Maria Augusta Trapp died in 1987. Much of her life she suffered with kidney problems as well. Johanna von Trapp died at the age of 75 in 1994. Werner von Trapp passed away in 2007 at the age of 91. Agathe von Trapp passed away in 2013 at the age of 97. 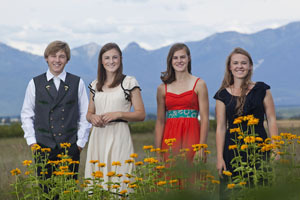 Four great grandchildren (left) of Captain von Trapp and Agathe Whitehead Trapp have been touring the world singing as ‘The Von Trapp Children’. They have made a number of CDs. The surviving members of the original von Trapp family live in Stowe, Vermont. Johannes von Trapp, the only son of Georg and Maria, assists in the operations of the Trapp Family Lodge (right). The Lodge offers many activities for all ages. The home where the Von Trapps once lived in Austria (left) was sold by the family, when it was returned to them after the war, to “The Missionaries of the Precious Blood”. In 2007, it was sold by the Missionaries. It is now “Villa Trapp” where guests can discover the home, where most of the Von Trapp family’s time was spent during the years 1923 to 1938. Recently at the Panorama Museum in Salzburg, Austria an exhibit took place on the Trapp family. It was called “The Trapp Famliy. Reality and “The Sound of Music”. It featured hundreds of items including original objects and photographs. 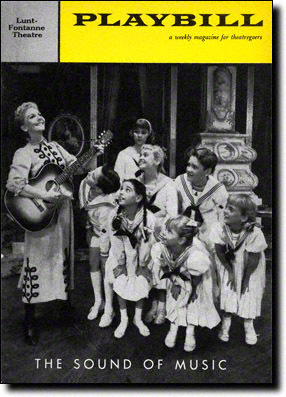 The musical version of the von Trapp family story premiered on Broadway (left), with music and lyrics by Rodgers and Hammerstein, in t he Lunt-Fontanne Theatre on November 16, 1959 as The Sound of Music. Mary Martin played the role of Maria. The show broke box office records and ran for 1,443 performances. The Sound of Music movie (right) was released in 1965. The film was extremely popular, as the musical before it, and grossed over 150 million dollars. It starred Julie Andrews as Maria and Christopher Plummer as Captain Von Trapp. The musical had a revival on Broadway in 1998 at the Martin Beck Theatre and it ran for 533 performances. Rebecca Luker played Maria Rainer. It grossed over 17 million dollars. 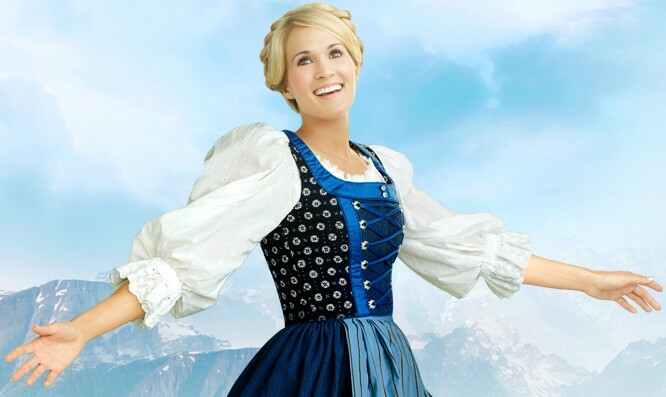 A version of The Sound of Music recently premiered on NBC, starring Carrie Underwood as Maria. It was released on DVD on December 17, 2013. The CD recording of the music was released on December 5. Although there are seven children in the movie, as there were in real life, the names and ages are changed. Below is a table of the names and ages when Maria came to the Trapp home in 1926.